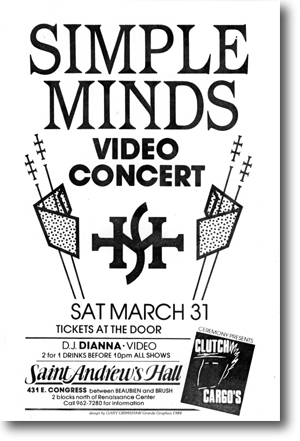 Faced with a few months lull between the release of Sparkle In The Rain and Simple Minds' appearance on tour in the USA in May, A&M decided to fill the gap with a Video Tour. Halls were booked across the States where the band’s videos were presumably shown back-to-back. Apart from a singular flyer for the event, and a mention of the Video Tour in another A&M press release, nothing else is known about this project. As no-one has ever mentioned attending any of these Video Concerts, then we don’t even know what was actually shown. Perhaps, one day, someone will find a box of dusty video tapes in the old A&M archive, and the questions surrounding the Video Tour will be answered. But, until then, it will remain a mystery.